The VF-1 was developed by Stonewell/Bellcom/Shinnakasu for the U.N. Spacy by using alien Overtechnology obtained from the SDF-1 Macross alien spaceship. Its production was preceded by an aerodynamic proving version of its airframe, the VF-X. Unlike all later VF vehicles, the VF-X was strictly a jet aircraft, built to demonstrate that a jet fighter with the features necessary to convert to Battroid mode was aerodynamically feasible. After the VF-X's testing was finished, an advanced concept atmospheric-only prototype, the VF-0 Phoenix, was flight-tested from 2005 to 2007 and briefly served as an active-duty fighter from 2007 to the VF-1's rollout in late 2008, while the bugs were being worked out of the full-up VF-1 prototype (VF-X-1). The space-capable VF-1's combat debut was on February 7, 2009, during the Battle of South Ataria Island - the first battle of Space War I - and remained the mainstay fighter of the U.N. Spacy for the entire conflict. Introduced in 2008, the VF-1 would be out of frontline service just five years later, though. The VF-1 proved to be an extremely capable craft, successfully combating a variety of Zentraedi mecha even in most sorties which saw UN Spacy forces significantly outnumbered. The versatility of the Valkyrie design enabled the variable fighter to act as both large-scale infantry and as air/space superiority fighter. The signature skills of U.N. Spacy ace pilot Maximilian Jenius exemplified the effectiveness of the variable systems as he near-constantly transformed the Valkyrie in battle to seize advantages of each mode as combat conditions changed from moment to moment. The basic VF-1 was deployed in four minor variants (designated A, D, J, and S) and its success was increased by continued development of various enhancements including the GBP-1S "Armored" Valkyrie, FAST Pack "Super" Valkyrie and the additional RÖ-X2 heavy cannon pack weapon system for the VF-1S for additional firepower. The FAST Pack system was designed to enhance the VF-1 Valkyrie variable fighter, and the initial V1.0 came in the form of conformal pallets that could be attached to the fighter’s leg flanks for additional fuel – primarily for Long Range Interdiction tasks in atmospheric environment. Later FAST Packs were designed for space operations. The following FAST Pack 2.0 system featured two 120.000 kg class P&W+EF-2001 booster thrusters (mounted on the dorsal section of the VF-1) and two CTB-04 conformal propellant/coolant tanks (mounted on the leg/engines), since the VF-1's internal tanks could not carry enough propellant to achieve a stable orbit from Earth bases and needed the help of a booster pack to reach Low Earth Orbit. Anyway, the FAST Pack 2.0 wasn't adapted for atmospheric use, due to its impact on a Valkyrie's aerodynamics and its weight; as such, it needed to be discarded before atmospheric entry. Included in the FAST Pack boosters and conformal tanks were six high-maneuverability vernier thrusters and two low-thrust vernier thrusters beneath multipurpose hook/handles in two dorsal-mounted NP-BP-01, as well as ten more high-maneuverability vernier thrusters and two low-thrust vernier thrusters beneath multipurpose hook/handles in the two leg/engine-mounted NP-FB-01 systems. Granting the VF-1 a significantly increased weapons payload as well as greater fuel and thrust, Shinnakasu Heavy Industry's FAST Pack system 2.0 was in every way a major success in space combat. The first VF-1 equipped with FAST Packs was deployed in January 2010 for an interception mission. Following first operational deployment and its effectiveness, the FAST Pack system was embraced enthusiastically by the U.N. Spacy and found wide use. By February 2010, there were already over 300+ so-called "Super Valkyries" stationed onboard the SDF-1 Macross alone. The FAST Pack went through constant further development, including upgraded versions for late production and updated VF-1s (V3.0 and V4.0). Another addition to the early V2.0 variant of 2010 was the so-called “S-FAST Pack”. The S-FAST pack was originally developed at the Apollo lunar base, for the locally based VF-1 interceptor squadrons that were tasked with the defense of this important production and habitat site on the Moon, but it also found its way to other orbital stations and carriers. Officially designated FAST Pack V2.1, the S-FAST Pack consisted of the standard pair of dorsal rocket boosters plus the pallets with additional maneuvering jets, sensors and weapons. The S-FAST pack added another pair of P&W+EF-2001 boosters under the inner wings, having the duty to give to fighter the power necessary to exit easily from the gravity of moons or little planets without atmosphere, and improve acceleration during combat situations. Range was also further extended, together with additional life support systems for prolonged deep space operations, or the case of emergency. In order to accept the S-FAST pack and exploit its potential, the VF-1’s wings and inner wing attachment points had to be strengthened due to the additional load and propulsion. The use of the S-FAST pack also precluded the fighter from transforming into Battroid or Gerwalk mode – the underwing packs had to be jettisoned beforehand. The other standard FAST Pack 2.0 elements could still be carried, though. The modfied Valkyries capable of accepting the S-FAST Pack received an additional “S” to their type designation – more than 100 VF-1s were converted or built in this deep space configuration until late 2011. Initial deployment of the S-FAST Pack was conducted through SVF-24 “Moon Shadows” in early 2010, a unit that was quickly disbanded, though, but re-formed as SVF-124 “Moon Shooters”, tasked with the defense of the lunar Apollo Base and several special missions. After the end of Space War I, the VF-1 continued to be manufactured both in the Sol system and throughout the UNG space colonies. Although the VF-1 would eventually be replaced as the primary Variable Fighter of the U.N. Spacy by the more capable, but also much bigger, VF-4 Lightning III in 2020, a long service record and continued production after the war proved the lasting worth of the design. However, the fighter remained active in many second line units and continued to show its worthiness years later, e. g. through Milia Jenius who would use her old VF-1 fighter in defense of the colonization fleet - 35 years after the type's service introduction! Standard time from Fighter to Battroid (automated): under 5 sec. Min. time from Fighter to Battroid (manual): 0.9 sec. This VF-1 is another contribution to the “Old Kit” Group Build at whatifmodelers.com, running in late 2016. I am not certain about the moulds’ inception date, but since it is an ARII incarnation of this type of kit and even moulded in the early pastel green styrene, I’d think that it was produced in 1982 or 83. Anyway, I love the Macross VF-1, IMHO a design masterpiece created by Shoji Kawamori and one of my favorite mecha designs ever, because it was created as a late 70ies style jet fighter that could transform into a robot in a secondary role. As a simple, purposeful military vehicle. And not like a flashy robot toy. Effectively, this Super Valkyrie is a highly modified OOB kit with many donation parts, and this kit is a bit special, for several reasons. There are several 1:100 OOB kits with FAST Packs from ARII/Bandai available (and still around today), but these are normally only Battroids or Gerwalks with additional parts for the FAST kit conversion. The kit I used here is different: it is, after maybe 25 years of searching and building these kits, the #70 from the original production run. It is (so far!) the only Fighter mode kit with the additional FAST Pack parts! Must be rare, and I have never seen it in catalogues? Until today, I converted my Super or Strike Valkyries from Gerwalk kits, a task that needs some improvisation esp. around the folded arms between the legs, and there’s no OOB option for an extended landing gear. The latter made this Fighter mode kit very attractive, even though the actual kit is pretty disappointing, and AFAIK this kit variant is only available as a VF-1S. With the Super Valkyrie fighter kit you receive basically a Gerwalk with a standard fighter cockpit (which includes a front wheel well and an extended front wheel leg), plus extra parts. The leg/engine-mounted NP-FB-01 systems are less bulbous than the parts on the Gerwalk or Battroid kit, and the OOB dorsally mounted NP-BP-01 boosters are TINY, maybe 1:120 or even 1:144! WTF? Further confusion: the kit includes a set of lower arm parts with integrated rocket launchers, but these are not necessary at all for the Fighter build?! As a kind of compensation there’s a new and exclusive element that simulates the folded arms under the ‘fuselage’ and which, as an added value, properly holds the hand gun under the fuselage. As a quirky flaw, though, the hand gun itself comes in the extended form for the Battroid/Gerwalk mode. For the fighter in flight mode, it has to be modified, but that’s easily done. Building such a Super/Strike Valkyrie means building separate components, with a marriage of parts as one of the final steps. Consequently, cockpit, central fuselage with the wings and the air intakes, the folded stabilizer pack, the folded arms element with the handgun, the two legs and the four boosters plus other ordnance had to be built and painted separately. Here and there, details were changed or added, e. g. a different head (a ‘J’ head for the flight leader’s aircraft with two instead of the rare, OOB ‘S’ variant with four laser cannon), covers for the main landing gear (the latter does not come with wells at all, but I did not scratch them since they are hardly recognizable when the kit is sitting on the ground), the typical blade aerials under the cockpit and the feet had to be modified internally to become truly ‘open’ jet exhausts. The wing-mounted boosters received new nozzles and their front end was re-sculpted with 2C putty into a square shape, according to reference sketches. Not 100% exact, but the rest of the VF-1 isn’t either. This VF-1 was also supposed to carry external ordnance and my first choice were four wing-mounted RMS-1 Anti-Ship Reaction Warheads, scratched from four 1.000 lb NATO bombs. But, once finished, I was not happy with them. So I looked for another option, and in a source book I found several laser-guided bombs and missiles, also for orbital use, and from this inspiration comes the final ordnance: four rocket-propelled kinetic impact projectiles. These are actually 1:72 JASDF LGB’s from a Hasegawa weapon set, sans aerodynamic steering surfaces and with rocket boosters added to the tail. Also not perfect, but their white color and sleek shape is a good counterpart to the FAST elements. Experience from many former builds of this mecha kit family helped a lot, since the #70 kit is very basic and nothing really fits well. Even though there are not many major seams or large elements, PSR work was considerable. This is not a pleasant build, rather a fight with a lot of compromises and semi-accuracies. Seriously, if you want a decent 1:100 VF-1, I’d rather recommend the much more modern WAVE kits (including more realistic proportions). The paint scheme for this Super Valkyrie was settled upon before I considered the S-FAST Pack addition: U.N. Spacy’s SVF-124 is authentic, as well as its unique camouflage paint scheme. The latter is a special scheme for the lunar environment where the unit was originally formed and based, with all-black undersides, a high, wavy waterline and a light grey upper surface, plus some medium grey trim and a few colorful US Navy style markings and codes. My core reference is a ‘naked’ bread-and-butter VF-1A of SVF-124 in Fighter mode, depicted as a profile in a VF-1 source book from SoftBank Publishing. The colors for the FAST Pack elements are guesstimates and personal interpretations, though, since I could not find any reference for their look in this unit. As a side note, another, later SVF-124 aircraft in a similar design is included as an option in a limited edition 1:72 VF-22S kit from Hasegawa, which is backed by CG pics in a VF-22 source book from Softbank, too. 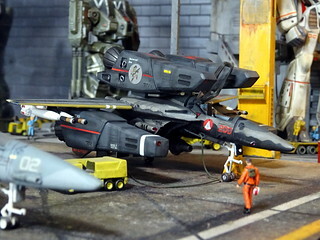 Furthermore, SVF-124 finds mention in a Japanese modeler magazine, where the aforementioned VF-22S kit was presented in 2008. So there must be something behind the ‘Moon Shooters’ squadron. According to the Hasegawa VF-22S’s painting instructions, the underside becomes black and the upper surfaces are to be painted with FS36270 (with some darker fields on the VF-22, though, similar to the USAF F-15 counter-shaded air superiority scheme, just a tad darker). Due to the 1:100 scale tininess of my VF-1, I alternatively went for Revell 75 (RAL 7039), which is lighter and also has a brownish hue, so that the resulting aircraft would not look too cold and murky, and not resemble an USAF aircraft. All FAST Pack elements were painted in a uniform dark grey (Humbrol 32), while some subtle decorative trim on the upper surfaces, e.g. the canopy frame, an anti-glare panel and a stripe behind the cockpit and decoration trim on the wings’ upper surfaces, was added with Revell 77 (RAL 7012). Overall, colors are rather dull, but IMHO very effective in the “landscape” this machine is supposed to operate, and the few colorful markings stand out even more! The cockpit interior was painted in a bluish grey, with reddish brown seat cushions (late 70ies style! ), and the landing gear became all white. For some added detail I painted the wings’ leading edges in a mustard tone (Humbrol 225, Mid Stone). The kit received some weathering (black ink wash, drybrushing on panels) and extra treatment of the panel lines – even though the FAST Pack elements hide a lot of surface or obscure view. More color and individuality came with the markings. The standard decals like stencils or the U.N. Spacy insignia come from the kit’s and some other VF-1s’ OOB sheets. Based on the SVF-124 VF-1 profile and taking the basic design a bit further, I used dull red USAF 45° digits for the 2nd flight leader’s “200” modex and the Apollo Base’s code “MA” on the dorsal boosters. Some discreet red trim was also applied to the FAST Packs – but only a little. Finally, after some soot stains around the exhausts and some vernier nozzels with graphite, the kit received a coat of matt acrylic varnish. Building this vintage VF-1 kit took a while and a lot of effort, but I like the result: with the S-FAST Pack, the elegant VF-1 turned into a massive space fighter hulk! The normal Super Valkyries already look very compact and purposeful, but this here is truly menacing. Especially when standing on its own feet/landing gear, with its nose-down stance and the small, original wheels, this thing reminds of a Space Shuttle that had just landed. Good that I recently built a simple VF-1 fighter as a warm-up session. ARII’s kit #70 is not a pleasant build, rather a fight with the elements and coupled with a lot of compromises – if you want a Super Valkyrie Fighter in 1:100, the much more modern WAVE kit is IMHO the better option (and actually not much more pricey than this vintage collector’s item). But for the vintage feeling, this exotic model kit was just the right ticket, and it turned, despite many weaknesses and rather corny details, into an impressive fighter. Esp. the lunar camouflage scheme looks odd, but very unique and purposeful.